True. But does he lead them towards a recognition of Jesus Christ as their Savior? No. I think that's the key. That's assuming Jesus NEEDS to be recognized as savior. It's like the Muslim asking, "but does he (Jesus) lead others toward the recognition that Muhammad is the greatest prophet." Yes, I do see a problem!! And it's not called mistranslation. It's called misinterperatation. And Ilene, I have looked into mistranslations, and what do I see?? Man messing with the WORD OF GOD!!! Atheists and other deniers like to bicker over a word and point out that it is used so and so many times in one translation and never used in some other translation, and this means this and that. The word "homosexual" did not exist in the times when Bible was written, yet the authors knew what it was and were able to describe it quite clearly without the need for a specific word: "'If a man lies with a man as one lies with a woman". It is crystal clear, yet some bicker over this and insist that the word homosexual was not used in the OT, and therefore the Bible has nothing against it. And now we hear this about the word "hell", coming from people who are trying to prove there is no such thing. When people resort to these tactics they are twisting the truth. The word doesn't matter, the context does. I don't care what they call hell, be it hell, lake of fire, place of eternal torment etc, because it is clear what the authors are describing. They are talking about hell, and they are talking about homosexuals. Let's not fool ourselves. Isn't the whole point behind Christianity that we all come to accept Jesus Christ as our Savior and as the only means by which we can be reconciled to God? It sounds as if you're putting prophets on the same level as Jesus Christ, but maybe I'm misunderstanding you. I'm still a futurist and still believe all the same things I did before....only the belief that hell meaning "the lake of fire" has changed. And that the majority of mankind is going to go there. You have to go to the greek to understand that hell does not mean what our translations portray it to mean. It's one word that has been severely mistranslated and used to mean several things when in fact it does not. Hell simply means "to cover" or "to conceal". That might be the point of Christianity, but this does not mean it is the point of every other religion including Islam. Christianity has its perceived reality, but so does Islam and Zorastrianism and Bahaism and so on. Muhammad's worldview did not include Christianity's perceived reality about Jesus and conversely, Christianity does not include Islam's perceived reality in their theology. The meaning that is behind the GREEK word HADES has to do with the GREEK UNDERWORLD! It should NEVER have been translated this way! This goes against ALL Hebrew thought! I repeatedly have asked for a good explanation as to why I am supposed to believe that the HEBREWS would have understood the afterlife this way! Nobody has answered, and nobody will read the link that I keep posting on Sheol/Hell, except Ilene, I guess. IT should have been translated "GRAVE" throughout the Bible, and, in fact, some of the KJV does have footnotes in odd places showing that it means "grave." There is not a SINGLE word in the Bible that should be translated "HELL" these days, as it has NO MEANING except "Unseen" in the Old English, but this crazy world has attached a NIGHTMARISH scenario to it! 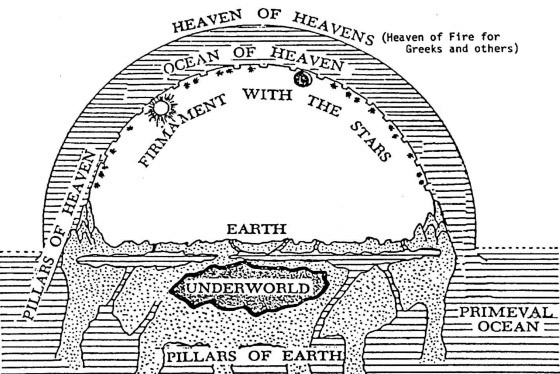 The Hebrews would have laughed in amazement that Christians believed in the pagan underworlds! For Pete's sake! IT is utter mayhem! The more I study, the angrier I get at the lies I have been told! Last edited by Finn_Jarber; 05-16-2010 at 04:25 PM.. Which version is right, Finn_Jarber? There are, in FACT, many contradictions in the Bible. The reasons why the versions keep changing is because meanings and usage of words keep changing. The KJV that we have now isn't even the ORIGINAL version! I had a meltdown, because I USED to believe that there were NO MISTAKES in the BIBLE, but, as people kept pointing them out, I had to look, and being the intelligent kind of person that I am, I SAW THEM! So, I was left with either doing what my mom did, which was to chuck everything, or doing what my dad did, which is start studying! I chose to study! And I am GLAD I did! Many intelligent people have ended up chucking the Bible because they started realizing that the folks above them were either incredibly stupid or lying to them. This fight against tradition for me has been very hard; I can either panic, and drop my faith, or I can do some diligent and intelligent study and find out WHO GOD is and WHAT HE IS ABOUT! What is His CHARACTER about? What does He want from humanity? Those answers, for me, are still in scripture, but it is not the pagan God of tradition that I am interested in. I want to know who the Hebrew God was and why He showed up like He did in Human form as Yeshua. That is ALL I'm interested in these days.